My friend Chrissy, who is a food lover like me, wanted something peachy and savory. So I thought pulled pork is big in Georgia and so are peaches so why not combine the two and make it party size? That’s the ticket! Hold on to your pants, or you might pop a button after you taste these because you won’t be able to stop eating them! This dish isn’t the “true” pulled pork that has been gently massaged with secret herbs and spices and then cooked for hours in a smoker. It’s done in a crock pot. So I guess I can’t really call it pulled pork, but it looks like it and it smells like it (only with Southeastern flair) so I’m going to go with it. 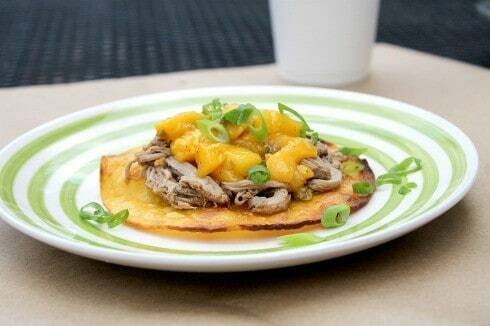 Pulled pork is great all year round but peaches are best in the summer time. This dish is great for a late afternoon snack in the summer and a great way to use all those ripe peaches lying around. Start this the night before in the crock pot with the first 6 ingredients. 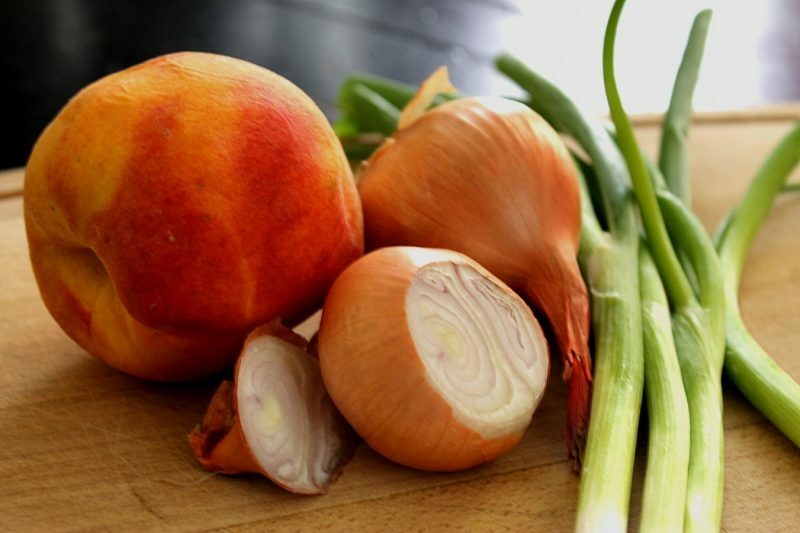 Put all these ingredients in the crock pot and turn on low overnight. The pork will be nice and tender come morning. Store this until ready to use. Reheat when ready to assemble. Start by making the tostadas. 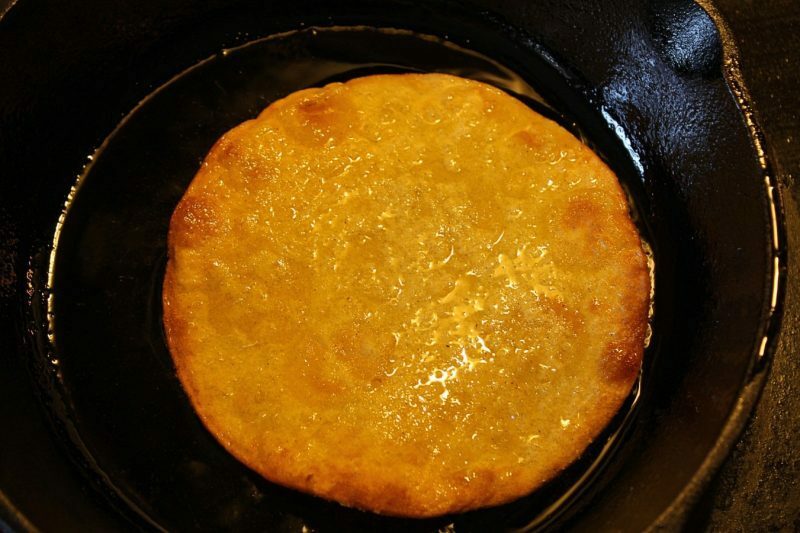 Heat up the frying oil in a pan over medium high heat. Fry tortillas one at a time, about 2 minutes per side or when they start to brown around the edges. Remove to a paper towel-lined plate to drain. Next start the compote. Heat the olive oil in a pan over medium heat. Add the shallots and cook until tender. Add the peaches, jalapeno, and salsa verde. 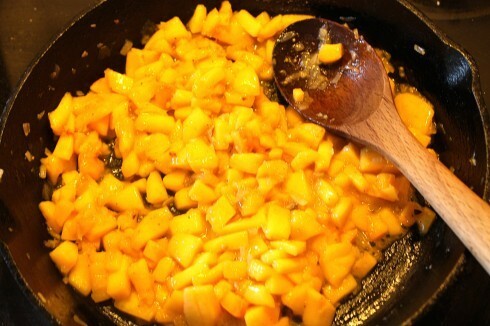 Cook until peaches are releasing their juices and starting to break down. This should take about 5-8 minutes. Remove from heat and place in a bowl. 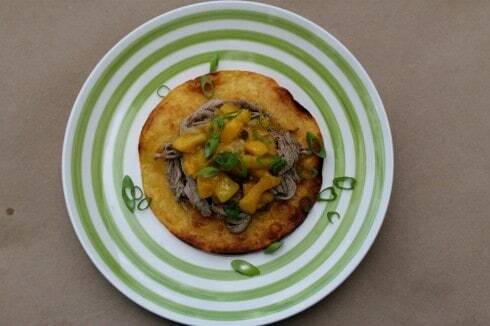 When ready to assemble, place a tostada on a plate and top with pork and compote. Garnish with sliced green onions. love pulled pork! never though to combine it with peaches before, definitely missing out on something seriously delicious. love it! Thanks so much! 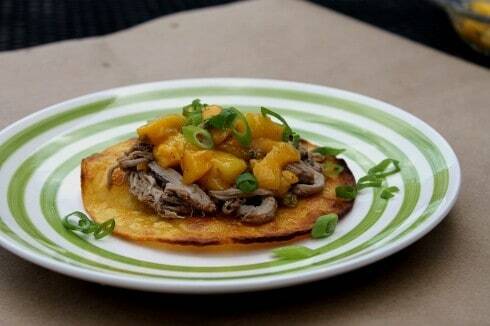 I love tacos and pulled pork so they were my inspiration for the dish. I’ve had pineapple salsa but with all these peaches lying around I thought I’d switch it up a bit. 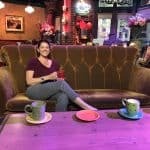 Thanks for stopping by my blog and hope you will come back!